“A friend who has accompanied us as a journalist for a long time in the forest, fell today from a suspension bridge over 20 meters high in Beechtown and died. 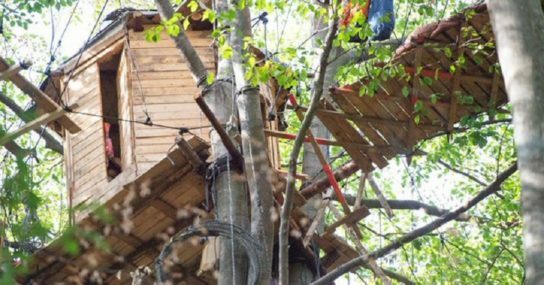 At that time police and RWE tried to evict the tree house village. The SEK was in the process of arresting an activist near the suspension bridge. Our friend was apparently on the way there when he fell. What is needed now is a moment of rest. Update: The deceased was a photographer and longtime friend of the occupants ande he was doing a report on the eviction of tree houses. He fell on his back from a height of about 20 meters, not having resisted his injuries. The police invasion is over for now.